Dozens of streets near the water in Charleston were flooded and water levels at the gauge downtown were 9.4 feet at high tide around 12:30 p.m. Monday. Forecasters say the ocean may rise a little more, but they don’t expect a surge anywhere near the 12.5 feet recorded when Hurricane Hugo came ashore just north of Charleston in 1989. Gov. Nathan Deal has declared a state of emergency for all of Georgia. Irma’s center was forecast to cross the Georgia-Florida line Monday afternoon but tropical storm winds were extending more than 400 miles. The National Weather Service said the threat of storm surge had decreased Monday along Georgia’s 100 miles of coast, but flooding rains could still cause swollen rivers, streams and creeks to overflow. Irma was forecast to cross the Georgia-Florida line Monday afternoon. Though downgraded to a tropical storm, its winds reached up to 415 miles from the center. The island of 42,000 people is under an evacuation order. Forecasters warn wind gusts around 60 mph and storm surge of up to 6 feet are possible later Monday. Actress Kristen Bell says she’s “singing in a hurricane” while riding out Irma in Florida. Bell also helped out the parents of “Frozen” co-star Josh Gad by securing them a room at the hotel. A third construction crane has toppled in Florida in the powerful winds of Hurricane Irma. 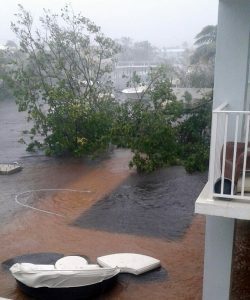 Officials say it happened at a project on Fort Lauderdale beach during the storm Sunday. Officials with developer The Related Group told the Sun-Sentinel the crane collapse caused no injuries and did not appear to damage anything else. Two other cranes toppled earlier in Miami as Irma swirled up the state. Miami International Airport has announced it will be closed Monday and begin only limited flights on Tuesday. Orlando International Airport closed Saturday and won’t reopen to passenger traffic until after Hurricane Irma has passed, a damage assessment has been completed, necessary recovery efforts made and the airlines are consulted to determine when best to resume operations. Fort Lauderdale-Hollywood International Airport says on its website it has no timetable yet to reopen. Its last flights were Friday. Tampa International Airport also is closed as Hurricane Irma moves up the Florida peninsula. Airlines are preparing their recovery schedules, which may take several days to execute. Monroe County Administrator Roman Gastesi says relief will arrive on a C-130 military plane Monday morning at the Key West International Airport. Once it’s light out, they’ll check on survivors. They suspect they may find fatalities. Hurricane Irma made landfall Sunday morning in Cudjoe Key. The U.S. Departments of State and Defense are working on evacuation flights from St. Martin after Hurricane Irma. Officials say U.S. citizens in need of evacuation should shelter in place until Monday, listening for radio updates, and then go to the airport by noon, bringing proof of citizenship and just one small bag. The State Department adds that a Royal Caribbean Cruise Line ship has left the island. More than 3.3 million homes and businesses – and counting – have lost power in Florida as Hurricane Irma moves up the peninsula. The widespread outages stretch from the Florida Keys all the way into central Florida. Florida Power & Light, the state’s largest electric utility, said there were nearly 1 million customers without power in Miami-Dade County alone. The power outages are expected to increase as the storm edges further north. There are roughly 7 million residential customers in the state. 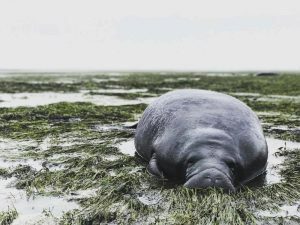 Two manatees were stranded after Hurricane Irma sucked the water out of Sarasota Bay, in Florida’s Manatee County. It’s been difficult to determine the extent of damage Hurricane Irma caused in the Florida Keys, where communication has been difficult and authorities are warning boaters and drivers to stay away. He described whiteout conditions, with howling winds that sucked dry the gulf side of the narrow island, where the tide is usually 8 feet deep. He kept his humor though, texting to “send cold beer” at one point. Now he sees furniture floating down the street with small boats. He says the storm surge was at least 6 feet deep on his island, 76 miles from Irma’s eye. He can see now that structures survived, but the storm left a big mess at ground level. 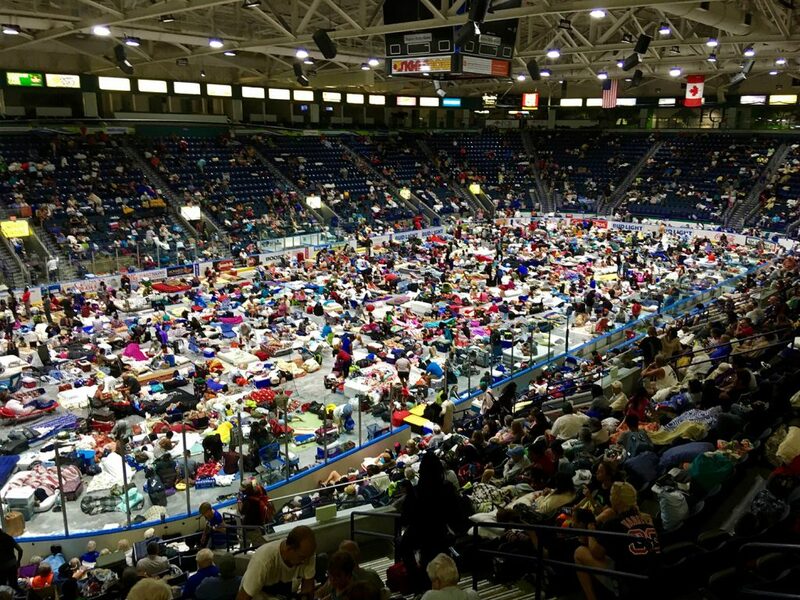 The Lee County Sheriff’s Office says water began leaking through the roof at the Germain Arena shelter in Estero just as the eye of Hurricane Irma drew near. The sheriff’s office posted on Facebook that authorities are monitoring the problem. 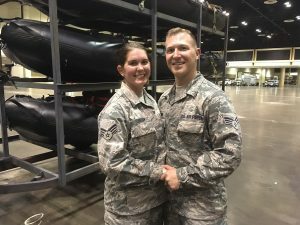 So instead of a poofy white dress, Durham got married in her Air National Guard fatigues, with no makeup, in a vast hangar filled with rescue vehicles in Orlando. Davis is a senior airman in the guard, like his bride, so they had called to say they’d miss their own wedding. The happy couple believes in service before self, and besides, they figure it’ll be a great story to tell their kids one day. President Trump has declared a major disaster in the state of Florida, making federal aid available to people affected by Hurricane Irma in nine counties already hit by the storm. Federal funding also is available to governments and nonprofit organizations for emergencies in all 67 Florida counties. 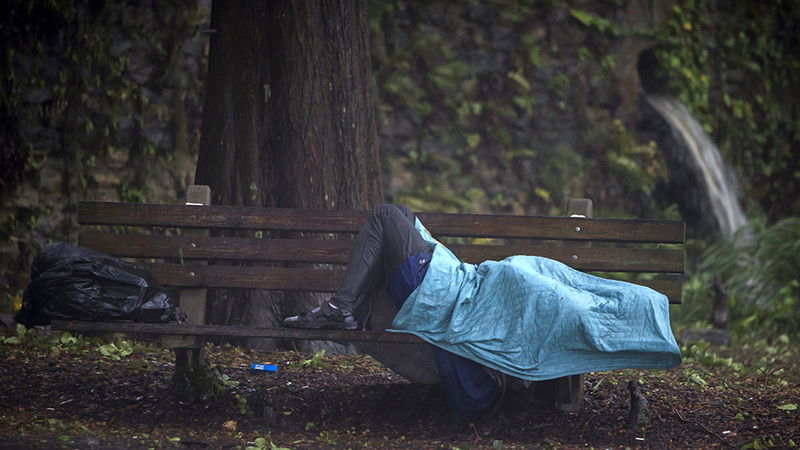 For the first 30 days, that money will cover 100 percent of the costs of some emergency responses. President Trump says the U.S. may have gotten a “little bit lucky” after Hurricane Irma veered from its original course and headed west along Florida’s coast. Trump says Irma will cost “a lot of money” but he isn’t thinking about that right now. Trump says he’ll be having additional meetings about coordination for the storm response. Hurricane Irma has weakened to a Category 2 storm, technically losing its major hurricane status, after making landfall in southwestern Florida. It is over land but hugging the coast as it moves north. The National Hurricane Center said Irma’s winds were at 110 mph, just below major hurricane status, as the center of the still dangerous and wide storm moved farther inland. It was 5 miles north of Naples late Sunday afternoon. It came ashore on Marco Island at 3:35 p.m. The hurricane center says the eye of Irma should hug Florida’s west coast through Monday morning and then push more inland over northern Florida and southwestern Georgia on Monday afternoon. The forecast puts the storm generally over the populated Tampa-St. Petersburg region a couple hours after midnight into Monday morning. Jeff Masters is meteorology director of the private Weather Underground. He says the fact that the storm approached the Tampa region from over land and from the south could slightly reduce the expected storm surge, although he says it will still be dangerous. Irma is producing deluges of 2 to 4 inches of rain an hour, which can cause flash flooding. The National Hurricane Center in Miami said Irma’s powerful eye roared ashore at Marco Island just south of Naples with 115 mph winds, for a second U.S. landfall at 3:35 p.m. Sunday. Category 3 storms have winds from 111 to 129 mph, but 130 mph wind gust was recently reported by the Marco Island Police Department. Irma’s second U.S. landfall was tied for the 21st strongest landfall in the U.S. based on central pressure. Irma’s first U.S. landfall in the Florida Keys was tied for seventh. The power companies say they have extra crews on hand to try to restore power – when it becomes safe to do so. Hurricane Irma is affecting the House of Representative’s work schedule in Washington. A notice from the House majority leader’s office says the House now doesn’t plan to take any votes Monday because of “the large number of absences” as a result of the storm. The National Hurricane Center said Irma had winds of 120 mph and was centered 20 miles south of Naples on Sunday afternoon. It was moving north at 12 mph. At that rate, the center of the storm should come ashore sometime between 4 and 5 p.m.
Hurricane Irma has pushed water out of a bay in Tampa, but forecasters are telling people not to venture out there, because it’s going to return with a potentially deadly vengeance. On Bayshore Boulevard in Tampa, approximately 100 people were walking Sunday afternoon on what was Old Tampa Bay – a body of water near downtown. Hurricane Irma’s winds and low tide have pushed the water unusually far from its normal position. Some people are venturing as far as 200 yards out to get to the water’s new edge. The water is normally about 4 to 5 feet deep and reaches a seawall. Miami City Manager Daniel Alfonso says a second tower crane has collapsed into a building under construction in the city’s downtown area. Alfonso told The Associated Press that the crane collapsed in a large development with multiple towers being built by Grand Paraiso. 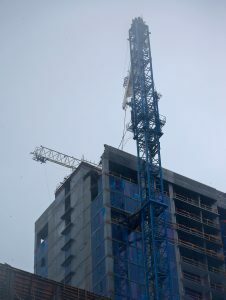 Another crane collapsed earlier Sunday onto a high-rise building that’s under construction in a bayfront area filled with hotels and high-rise condo and office buildings, near AmericanAirlines Arena. Officials said no one was injured as the result of either crane’s collapse. High winds are impeding Miami authorities’ ability to reach the cranes, and authorities are urging people to avoid the areas.